Published studies on pes cavus are in short supply, making evidence-based orthotic management a challenge. This author proposes a theory of pes cavus etiology based on muscle imbalances and reactions, which may support the concept of early orthotic intervention. Although medical knowledge regarding pes cavus exists, the research and treatment options, as well as any theories or hypotheses as to why humans develop this deformity, are quite limited. Traditionally, we have considered pes cavus a neuro­muscular problem with a surgical answer.3 By combining what is known with what we can hypothesize, perhaps we can establish a new and more successful approach to pes cavus. Pes cavus has a variety of classifications. However, many of these overlap, which can lead to confusion. The most common classification system categorizes pes cavus as neuromuscular, congenital, or traumatic. Researchers often differentiate idiopathic from congenital pes cavus.4 A large retrospective survey reviewed 465 patients with pes cavus and found that 81% were classified as having idiopathic pes cavus and 19% had neuromuscular pes cavus.5 Another study reviewed 77 patients in a pes cavus clinic and found that 33.8% of cases were idiopathic and 66.2% were neuromuscular.4 Despite this discrepancy between the two studies, each study found that a significant portion of the pes cavus patients had no known etiologic source of deformity. The high-arched foot has also been classified according to footprint morphology, radiography, visual inspection, and, most recently, the Foot Posture Index (FPI).2,6-8 The FPI is the most comprehensive of these methods because it distinguishes all foot types, not just the cavus foot, using point-based criteria. This statistically validated and consistent tool defines the cavus foot as any foot that has an FPI score between -5 and -12 on a scale from -12 to +12. A normal foot has a score between 0 and +5. The structure of pes cavus falls into anterior, posterior, and global categories.3 The anterior cavus is either total (indicating plantar flexion of the entire forefoot) or local (plantar flexion of the first ray only). The posterior type has a high calcaneal inclination angle but no forefoot equinus. The global type, sometimes referred to as combined cavus, is a combination of both deformities. With regard to function, the pes cavus foot has also been classified as either flexible or rigid. The myofascial band of the plantar aponeurosis maintains the deformity with the windlass effect.9 This effect tends to maintain greater rigidity in some individuals and less in others, depending on the flexibility of the patient’s midtarsal joint. The short and long plantar ligaments may also develop contractures due to decreasing motion across their respective joints, maintaining a more rigid cavus foot.10 Although this type of pes cavus classification is often the least emphasized, function may prove to be the most important consideration relative to orthotic therapy. These two variations of functioning cavus feet, though similar in appearance, act very differently. Anecdotally, one popular assumption holds that pes cavus deformity begins as a flexible entity and will become rigid if it is not treated. However, no evidence currently supports this speculation. The classification of pes cavus according to so many different parameters may signal that its origins have escaped the medical community. Classifying pes cavus as idiopathic gives it a place to fit, but this approach may be shortchanging our knowledge of the imbalance in muscle forces and strength associated with this condition. Practitioners began to evaluate adolescent flatfoot based on the strength of the tibialis posterior and the overpowering of the peroneus brevis muscle.12 This evolution of thought became a focus of investigation simply because several people pursued the obvious rationale that there must be a mechanical origin to flatfoot, not just a convenient category called idiopathic. Can muscle imbalance, the progression of deformity, and the resultant symptoms also be the basis of a theory for the mechanical origin of pes cavus? Figure 1. 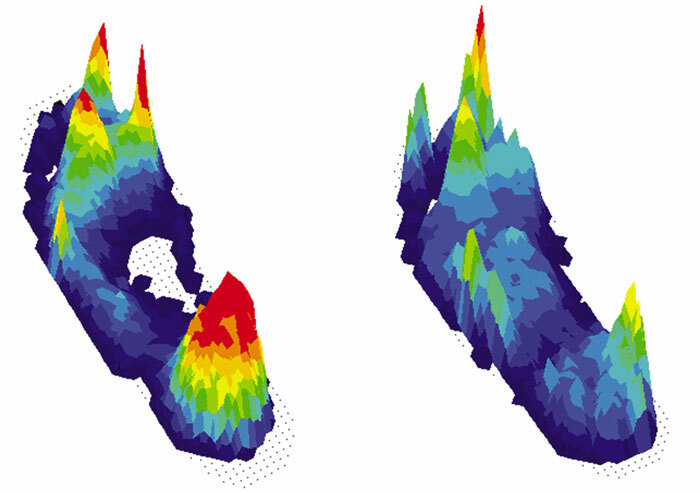 Transferring pressure toward the midfoot in patients with pes cavus by increasing orthotic arch height decreases forefoot pressure peaks, as illustrated by 3-D maps of plantar pressures without (left) and with (right) orthoses. I have yet to encounter non-neurologic pediatric cavus feet. If the tibialis anterior muscle is weak at birth, then the peroneus longus muscle will not have a strong enough antagonist. This would disrupt Kirby’s rotational equilibrium concept,13 leading to progressive plantar flexion of the first ray during osseous development toward adulthood. The plantar flexion of the first ray from the overpowering peroneus longus would force the talus into a more dorsiflexed position. This in turn would increase arch height and calcaneal inclination. This pattern of muscle imbalances and reactions is similar to the pattern that occurs with AAF, but produces a different morphology. The increased arch height would lead to a smaller contact area on the ground. Accordingly, there would be more pressure on the metatarsal heads and heel, resulting in symptoms related to these areas. Would early evaluation and intervention with orthotic therapy improve midlife clinical outcomes in these patients? Could early intervention slow down the progression of the deformities that result from a lifetime of compensation and metatarsalgia? Forward-looking studies may prove this true, as more investigators recognize that cavus foot is a mirror image of posterior dysfunction in the child and adult. A 1997 paper analyzed gait patterns in nine patients with painful pes cavus.14 The Italian researchers noted the presence of two different types: compensated pes cavus (greater ankle joint laxity) and noncompensated pes cavus. These are now considered functional variations. The compensated pes cavus foot had enough laxity to allow the metatarsal depression to be compensated by ankle joint and midtarsal joint dorsiflexion, reducing pain at the forefoot. Some individuals, because of heredity and genetics, are born with greater hip or ankle range of motion, while others have less than normal range of motion. The same must be true for the range of motion of the midtarsal joint—this is obvious to anyone who has examined a large number of feet. Individuals born with or developing cavus feet are not excused from this inevitability, and, therefore, some have a large range of motion of the midtarsal joint and will compensate for the unusual contact forces of a cavus foot. 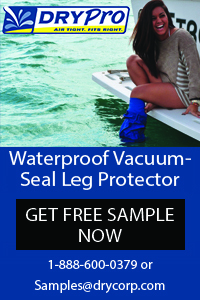 Those without much midtarsal motion will not be able to compensate. A 2001 study took a different approach, dealing with differences in foot types and related sports injuries.15 Researchers from the University of Delaware, Newark, studied two groups of runners with flat or high-arched feet to determine the differences in their injury patterns. They screened patients based on an arch ratio system.16 Although the FPI was not utilized, the individuals had either a high arch or a flat foot, but none had a normal arch height. The low-arched runners had more medial and soft-tissue injuries, while the high-arch runners had more lateral and bony injuries. The most common injuries in high-arched runners were plantar fasciitis, iliotibial band friction syndrome, and lateral ankle sprains. The most common type of bony injury observed in the high-arch group was stress fracture; all stress fractures occurred at the fifth metatarsal. This group had increased lateral loading compared with the low-arched individuals, and the center of pressure of the foot remained more lateral than the normal medial shift in normal gait throughout stance. This study has been one of the few to differentiate a true set of injuries experienced by people with cavus feet. Although runners are a unique population, the speed and increased contact forces compared with walkers help exaggerate the differences in injury distribution between the two types of foot morphologies. Remarkably, only since 2000 have studies begun to focus on orthotic therapy and symptoms related to pes cavus, specifically metatarsalgia. Considering that metatarsalgia is the most common symptom in patients with pes cavus,2 a review of studies on the effect of orthoses on metatarsalgia is relevant. Researchers from the Washington University School of Medicine in St. Louis measured peak pressure and pressure-time integrals in a study of patients with diabetic neuropathy and a history of plantar ulcers.17 An ulcer or pre-ulcer lesion are clear clinical signs of excessive metatarsal head pressure. We can, therefore, look at this study’s attempts to reduce metatarsal head pressure in patients with diabetes and extrapolate the results to efforts to reduce metatarsal head pressure in cavus feet. The researchers looked at the use of shoes alone, shoes with custom-molded total contact inserts, and shoes with total contact inserts and metatarsal pads. Both devices used in this study were designed to have a minimum fill or total contact design. The study followed 20 patients, 12 men and eight women, with a mean age of 57 years. When patients were given orthoses, peak plantar pressure and pressure-time integrals were reduced by 16% to 24%, respectively, compared with a shoe-only condition. When patients wore metatarsal pads with the total contact orthoses, the peak plantar pressure and pressure-time integral were reduced by 29% to 47% relative to the shoe-only condition. This study has applications in many patient groups, but is especially important for patients with pes cavus feet; almost 60% of this population suffer from metatarsalgia.2 Burns demonstrated in 20052 that patients with symptomatic cavus feet and metatarsalgia not only had greater pressure under the metatarsal head region but also that the pressure in that region was maintained for a longer time compared with individuals with noncavus feet. Some research has addressed whether padding the metatarsal area with soft materials or controlling motion with more rigid materials would reduce symptoms. Canadian researchers assessed patients with rheumatoid arthritis and metatarsalgia. Twenty-four individuals completed three 12-week interventions in random order: shoes alone, soft custom orthoses, and semirigid custom orthoses. The data demonstrated that semirigid devices had a highly statistically significant effect on pain, whereas neither soft orthoses nor supportive shoes alone had a statistically significant effect. Most recently, an Australian group published three relevant studies on the symptoms and mechanical treatment of cavus foot. Burns et al,2 as previously described, attempted to determine the relationship among pes cavus, pain, and foot deformity. Sixty percent of pes cavus patients complained of pain compared with 23% of patients without the deformity. Pressure-time integrals in all three areas of the foot (rearfoot, midfoot, and forefoot) were higher in the pes cavus group than in normal patients. There was also a significant correlation between higher pressure-time integrals and pain. In a later study of 130 individuals with painful idiopathic pes cavus,19 the Australian researchers also found that those patients demonstrated a more cautious gait pattern than individuals with normal feet. Peak plantar pressure and mean plantar pressure values were also lower than normal, particularly in the forefoot and rearfoot. Patients with pain limited to the rearfoot were more likely to demonstrate an antalgic gait pattern, lower plantar pressures, and higher pressure-time integrals than those with pain limited to the forefoot. The same research group also published the first randomized controlled trial20 to investigate the effectiveness of custom orthoses for the treatment of painful pes cavus deformity. One hundred fifty four patients with chronic idiopathic foot pain and bilateral cavus feet received either custom-molded orthoses made of 3-mm polypropylene with a Poron top cover or sham insoles of 3-mm foam. Researchers evaluated patients after three months for changes in quality of life, using the Foot Health Status Questionnaire21 and changes in plantar pressure measurements. The foot pain scores after three months of insole use improved by 43% with sham insoles and 74% with custom-molded orthoses. 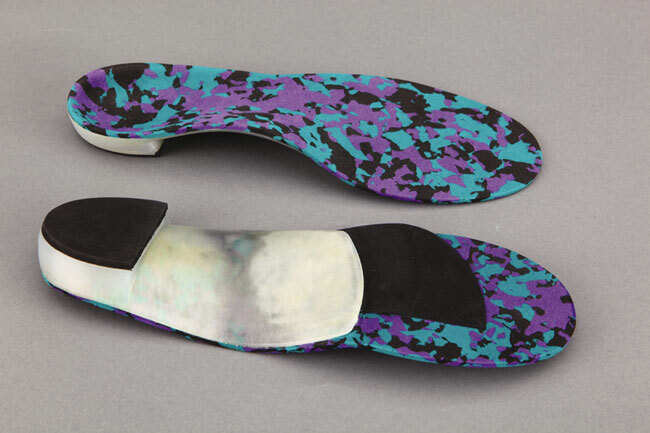 The peak pressure was 9% less than at baseline for the sham insole but 26% less than baseline for the custom-molded orthoses. Overall, the custom orthoses had a greater effect on quality of life, including statistically significant increases in activity and decreases in pain. One cannot overlook the value of improvement in both physical and mental health for patients with chronic pain and disability. Although the clinical studies concerning pes cavus are limited, the information is applicable to clinical scenarios. Cavus gait is specific and often limited by the amount of compensation available at the midtarsal and ankle joint. The runner study revealed that the injury pattern is somewhat predictable and can help guide orthotic fabrication details. The studies by the Australian group revealed that custom orthoses can relieve pain and decrease pressure-time integrals. The positive information gained from this research confirms the value of biomechanical intervention for patients with pes cavus. The typical complaints associated with pes cavus are pain, issues with shoe fit, and lateral ankle sprains. By focusing on the pathomechanics of cavus foot issues and applying the evidence in the literature, we can compile a list of prescription components for the ideal custom orthosis. The overload on the metatarsal heads is due to the limited contact area on the plantar surface of the foot created by the high arch. According to the proposed theory detailed earlier, there is also a domino effect from a weak anterior tibialis muscle, tight gastroc-soleus complex, overactive extensors for ground clearance, and extensor substitution or claw toe contractures that result in metatarsalgia. Figure 2. Semirigid orthoses with a very minimum arch fill, rearfoot post, 4-mm heel lift, and a forefoot valgus wedge or forefoot padding are recommended for pes cavus. Increasing the plantar surface contact area with a total contact orthosis ensures that more of the plantar pressure is being borne in the arch area and that the metatarsal heads are bearing less weight for shorter periods. 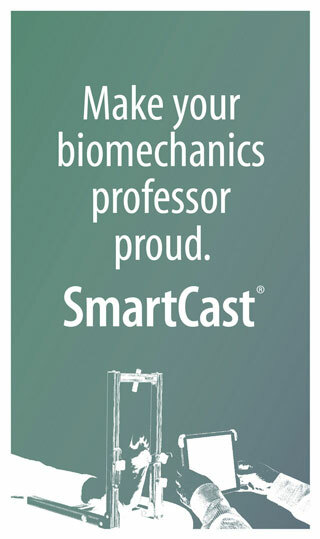 One can accomplish this by using a minimal fill cast correction technique, which raises the arch of the orthosis (total contact), and prescribing a semirigid or rigid device. Adding a metatarsal bar or a metatarsal pad will shift plantar pressures more proximally, away from the metatarsal heads. Leaving the anterior edge of the orthosis at full thickness (instead of beveled) produces a rocker-type effect, which shortens the time the metatarsal heads bear weight. A forefoot extension of soft durable material attenuates the pressure peaks under the metatarsal heads. Lateral ankle instability and a laterally deviated subtalar joint (STJ) axis are frequently associated with high-arched feet.22 The STJ axis lies more laterally and exits the foot at a different angle in the pes cavus foot than in the average STJ axis. This axis deviation leaves the pes cavus foot with more inversion as well as more plantar surface medial to the STJ axis, which increases the likelihood of supinatory moments across the STJ axis. Because the peroneus brevis has a shorter and less efficient moment arm to oppose these supinatory moments, this situation can increase the risk of lateral ankle sprain. The muscle imbalance inherent in the cavus foot leads to a plantar flexed first ray, subsequent rearfoot inversion, and lateral ankle instability by leaving the foot in an inverted position, as described in the theory of cavus pathomechanics. Leaving the lateral side of the rearfoot post unbeveled increases the surface area and effectiveness of the post by providing a more stable platform to resist inversion of the device. Adding a reverse Morton’s extension or a slight valgus forefoot extension creates a pronatory moment on the forefoot that counteracts the excessive supinatory moment. This makes the cavus foot less laterally unstable. Rearfoot instability is an extension of the laterally deviated subtalar axis. However, in flexible pes cavus feet, midtarsal flexibility compensates for this later in stance. The forefoot pathology produces midtarsal joint supination, which leads to excessive pronation of the rearfoot.23 Some pes cavus feet suffer from both lateral ankle instability at midstance and rearfoot pronation at late midstance. Adding a flat rearfoot post and a deep (>16 mm) heel cup helps stabilize the rearfoot by limiting rearfoot motion in relation to the supporting surface. Multiple problems contribute to the apropulsive antalgic gait of the pes cavus foot. Pain in the metatarsal heads or rearfoot can cause shortened strides, which can lead to excessive use of extensor tendons and eventually result in tendinitis, tendon fatigue, and even shin splints.19 Limited ankle joint motion also leads to shorter strides and limited propulsion and is often associated with pes cavus. Adding a 4-mm heel lift to the rearfoot post actually increases available ankle joint dorsiflexion by plantar flexing the talus. Also bear in mind that a wide orthosis will increase the surface area that contacts the arch of the foot and distribute more pressure to the midfoot and away from the forefoot and rearfoot. One must understand that, early in treatment, the morphology and pathomechanics of cavus feet are likely to be progressive, especially in the developmental form. Neurologic disorders, such as Charcot-Marie-Tooth disease and muscular dystrophy, create a progressive muscle imbalance.24 Orthotic and shoe interventions are likely to change on a regular basis. Frequent reevaluation and recasting are essential to follow the continually rising arch and shifting of symptoms. The true etiology of pes cavus remains one of our unsolved mysteries. The proposed pathomechanical model described above is one that future trials can test. Recent research is both enlightening and encouraging. However, it is apparent that more studies are needed. There are congenital and familial components to these feet, but there is much more to be studied about the progression. We need to recognize patients with cavus feet early in life, and studies need to document the effectiveness of orthoses and other early interventions for affecting midlife outcomes and avoiding symptoms. Paul R. Scherer, DPM, is a clinical professor in the College of Podiatric Sciences at the Western University of Health Sciences in Pomona, CA. A version of this article appears in his book, Recent Advances in Orthotic Therapy, published by Lower Extremity Review. For more information, call 518/452-6898. 1. Sachithanandam V, Joseph B. The influence of footwear on the prevalence of flatfoot: a survey of 1846 skeletally mature persons. J Bone Joint Surg Br 1995;77(2):254-257. 2. Burns J, Crosbie J, Hunt A, Ouvrier R. The effect of pes cavus on foot pain and plantar pressure. Clin Biomech 2005;20(9):877-882. 3. Vogler HW. Surgical management of neuromuscular deformities of the foot and ankle in children and adolescents. Clin Pediatr Med Surg 1987;4(1):175-206. 4. Ibrahim K. Pes cavus in surgery of the musculoskeletal system. In: Evarts GM, ed. Surgery of the Musculoskeletal System. Vol 5. New York, NY: Churchill Livingston; 1990: 4015-4034. 5. Brewerton DA, Sandifer PH, Sweetnam DR. “Idiopathic” pes cavus. Br Med J 1963;2(5358):659-661. 6. Cavanagh PR, Morag E, Boulton AJ, et al. The relationship of static foot structure to dynamic foot function. J Biomech 1997;30(3):243-250. 7. Walker M, Fan HJ. Relationship between foot pressure pattern and foot type. Foot Ankle Int 1998;19(6):379-383. 8. Redmond AC, Crosbie J, Ouvrier R. Development and validation of a novel rating system for scoring standing foot posture: the Foot Posture Index. Clin Biomech 2006;21(1):89-98. 9. Vogler HW, Howard D. Pes cavus. In: Levy LA, Hetherington VJ, eds. Principles and practice of podiatric medicine. 2nd ed. Brooklandville, MD: Data Trace; 2006:1-27. 10. Sabir M, Lyttle D. Pathogenesis of pes cavus in Charcot-Marie-Tooth disease. Clin Orthop Relat Res 1983;(175):173-178. 11. Johnson KA, Strom DE. Tibialis posterior tendon dysfunction. Clin Orthop Relat Res 1989;(239):196-206. 12. Bordelon RL. Hypermobile flatfoot in children; comprehensive evaluation and treatment. Clin Orthop Relat Res 1983;(181):7-14. 13. Kirby KA. Rotational equilibrium across the subtalar joint axis. J Am Podiatr Med Assoc 1989;79(1):1-14. 14. Benedetti MG, Catani F, Ceccarelli F, et al. 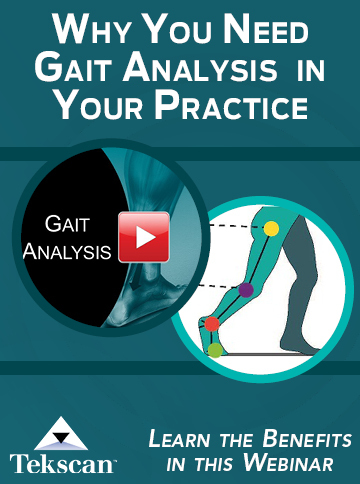 Gait analysis in pes cavus. Gait Posture 1997;5(2):169. 15. Williams DS, McClay IS, Hamill J. Arch structure and injury patterns in runners. Clin Biomech 2001;16(4):341-347. 16. Williams DS, McClay IS. Measurements used to characterize the foot and the medial longitudinal arch: reliability and validity. Phys Ther 2000;80(9):864-871. 17. Mueller MJ, Lott DJ, Hastings MK, et al. Efficacy and mechanism of orthotic devices to unload metatarsal heads in people with diabetes and a history of plantar ulcers. Phys Ther 2006;86(6):833-842. 18. Chalmers AC, Busby C, Goyert J, et al. Metatarsalgia and rheumatoid arthritis—a randomized, single blind, sequential trial comparing 2 types of foot orthoses and supportive shoes. J Rheumatol 2000;27(7):1643-1647. 19. Crosbie J, Burns J. Are in-shoe pressure characteristics in symptomatic idiopathic pes cavus related to the location of foot pain? Gait Posture 2008;27(1):16-22. 20. Burns J, Crosbie J, Ouvrier R, Hunt A. Effective orthotic therapy for the painful cavus foot: a randomized controlled trial. J Am Podiatr Med Assoc 2006;96(3):205-211. 21. Bennett PJ, Patterson C, Wearing S, Baglioni T. Development and validation of a questionnaire designed to measure foot health status. J Am Pediatr Med Assoc 1998;88(9):419-428. 22. Kirby KA. Foot and lower extremity biomechanics: A ten year collection of Precision Intricast newsletters. Vol 1. Payson, AZ: Precision Intricast; 1997: 23-24. 23. Root ML, Orien W, Weed JH. Normal and abnormal function of the foot. Vol 2. Los Angeles: Clinical Biomechanics; 1977. 24. Vogler HW. Paralytic deformities of the foot and ankle-surgical management. In: Marcinko DE, ed. Therapeutics of the foot and ankle. Baltimore: Williams & Wilkins; 1992: 531-550. As an orthotist for 34 years I have significant clinical experience in treating neurological cavus feet esp CMT. I also have significant experience in foot orthotic management of both the athlete and non-athlete. Although I have evaluated, designed and made my fair share of AFO’s for the neurological patient, my present practice is limited to pedorthotics: all of my technical work is done by me so I also have a great deal of experience in designing, fabricating and fitting foot orthotics. And with a family full of cavus feet I have quite a unique perspective on the “cavus” foot. In random order I will address a few of the issues by the author. 1. Having a high arch does not mean one has a “cavus” foot. Most people I see that have high arches are pronators. In weight bearing the talar head with be palpable on the medial side. This would not be happen in a true cavus foot. 2.. A true cavus foot does not pronate at anytime in stance phase. The medial talar head is never palpable in weight bearing on the cavus foot. Therefore this foot type is by my definition “rigid” and trends towards supination during stance phase. More supination occurs with those with plantar flexed 1st rays and also with those whose lateral heel structure has a decreasing radius on the plantar surface. True cavus feet represent less than 1% of the population I see in my clinic. Some cavus feet have a plantar flexed first ray and others do not. Ex: I have bil plantar flexed first rays yet both my brothers whose alignment is otherwise the same as mine do not have plantar flexed first rays. A cavus foot is not a result of muscle imbalance but a result of boney alignment that is inherited. If the author is correct in the “developmental” cavus foot then my mother, myself, my brothers and their children who all have cavus feet inherited the same muscle imbalance. I find this highly unlikely. More than likely one grows into the boney alignment and develops the associated claw toes and tight achilles as a result of said alignment. I was once very sick and was waiting on an evaluation by a neurologist. I looked at my wife and warned her the neurologist was going to take one look at my feet and ask if I had Charcot Marie Tooth. True to form she did exactly that in less than 5 minutes after meeting me. 2. Plantar flexed first ray’s are not uncommon throughout the general population and they are not limited to just the cavus feet. 3. Jone’s stress reactions/fractures: In addition to my private practice I was also responsible for providing all the orthotics services to a large Div. I school athletics department. I treated scores if not well over a hundred Jone’s fractures. A. I have NEVER seen a Jone’s fracture in a runner. A Jones’s stress fracture is first and foremost a torsional injury. 2. I have kept many of the foot casts (taken in non-weight bearing STJ neutral) on these Jone’s fractures. My vast clinical experience says it is entirely untrue there is a correlation between high arches and Jone’s fractures. In fact I am hard pressed to find high arched foot in the group much less a true rigid cavus foot. 4. Although metatarsalgia is easier to explain in the “tripod” plantar surface of a high arched individual I find it quite common in people with lower arches. 5. Neutral/normal foot: just what is a normal or neutral foot? I hear these terms used interchangeably over and over. Yet I find no consensus definition. I experience a wide variation in foot types that I refuse to use neutral/normal and pathological. I prefer to describe the foot from a functional perspective and with emphasis on comparison between the open and closed chain alignment. I do not think their is any mystery to the cavus foot. Nor is their any mystery to the high arched foot that pronates:with or without a PF 1st ray. They are what they are. Unless someone has a neurological or traumatic reason for a “true foot pathology” then the foot is just as much an part of our genome as the rest of our body. Thank you for this interesting and informative article. Treating patients with a cavus foot type, whilst challenging can be highly rewarding. The suggestions for orthotic design are sound. I sometimes also incorporate a lateral skive in the cast. I have done a lot of research on Sesamoiditis and I have found the Pes Cavus and Sesamoiditis tend to go hand in hand, the former causing the latter. The increased arch height causes downward pressure on the sesamoid bones causing inflammation and irritation. Fantastic write up. Brilliant in all aspects, very informative and hugely helpful. I have been looking for resources and information on the Pes Cavus and your article brings up a lot of great points. The issue may not be mainly of the process of alleviating the situation, but more of timing of treatment. It does make a lot of sense to incorporate orthotics very early, but it looks like there’s no guarantee. Looking forward to seeing any more test results with orthoses and Pes Cavus. I have Pes Cavus and neuropathy of both feet. Orthotics, electrical stimulation, water hot and cold (though not long because of skin peeling), more orthotics, no orthotics, tall shoes, flexible runner shoes- bad (! ), dress shoes, off the shelf orthotics, wild and weird shoes, tramodol, gabapentin, aspirin, Ibuprofen. In every case the numerous remedies have made things so much worse I thought I was at the end of my life. Truly if there is a fire in my home I will not be able to get out except crawl on all fours because my feet do not work well. Pedorthists that exclaim in bravado fashion that their inserts are the best are too naive to understand that wide outside diameter orthotics demand a wider shoe, so order the wrong one. To exacerbate things my skin peels off on the bottoms of both feet, to expose cracks as paper cuts. I would love to communicate with a good professional as well as offer my history to help future patients.